It’s late January, which means it’s officially Bubble Watch season. As the NCAA basketball regular season gets to the heart of the conference schedule, the tournament résumés of programs all around the country are coming into focus. For some of those teams, it means an opportunity to get some good wins on the board and try to recover from a disappointing non-conference schedule. For others, it means trying to hold on for dear life amidst the grind of playing in one of the nation’s toughest power conferences. Another season, another year of Syracuse going back and forth across the NCAA Tournament bubble. Syracuse is a #10 seed in the latest Bracketology projection from ESPN’s Joe Lunardi, and they face an insanely tough schedule down the stretch. The Orange have road games at Virginia Tech, NC State, and UNC, as well as home matchups with Duke and UVA. Four losses in non-conference play (including to Old Dominion and UConn) was always going to make it an uphill climb for Syracuse in the notoriously difficult ACC. So far they’ve made it work, and if we know anything, it’s that the committee doesn’t mind voting for a double-digit loss Syracuse to make the field of 68. 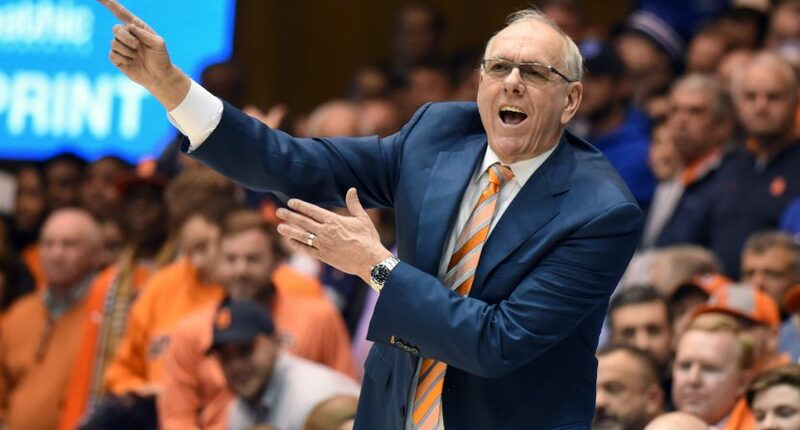 The Orange are probably safe thanks to their electrifying road win at #1 Duke… but Jim Boeheim and company shouldn’t exactly feel like they can coast down the stretch. Butler… on the bubble? Those words just don’t seem like they should go together in a complete sentence. The Bulldogs have made it to the big dance in 10 out of the last 12 seasons including two trips to the National Championship Game. It’s hard to consider them a mid-major program anymore playing in the Big East, which gives them a much more consistent schedule than the Horizon League. At 12-8, Butler has a tough road to get back to the NCAA Tournament as many chances for statement wins have come and gone. The Bulldogs have been particularly hard done by in several close losses against tourney contenders. There was the buzzer-beater heartbreak against Indiana and one-point losses to Seton Hall and Xavier in conference play. Butler can’t afford anymore slip-ups and probably need a regular season victory against Marquette or Villanova to give a much needed boost to their résumé. This would’ve sounded crazy a couple months ago when Ohio State was ranked #1 in the country… albeit in the NCAA’s widely panned NET rankings. But in spite of that questionable ascent, the Buckeyes looked to be in great shape. Chris Holtmann has built on the foundation laid by Thad Matta and had Ohio State at 12-1 entering the meat of the Big Ten schedule. However, Ohio State has been badly exposed by five consecutive Big ten losses, even an ugly one to Rutgers. The five-game skid is Ohio State’s longest losing streak since the 1997-1998 season, which was Jim O’Brien’s first season in charge. Their best player Kaleb Wesson can’t seem to stay on the floor due to foul trouble, and they’re struggling to shoot from deep, ranking 177th in the country in three-pointers per game. Yes, the Big Ten is incredibly deep, but OSU currently sits at 11th in the standings. And the road isn’t going to get any easier- their next two games are on the road at Nebraska and Michigan. It’s going to be hard for the committee to look at a team with a seven-game losing streak and consider them tournament material, especially when their best win to date is against Cincinnati. If the freefall continues, OSU could end up on the outside looking in come March. Shaka Smart was once one of the brightest head coaching prospects in all of basketball. When VCU met Butler in the 2011 Final Four, who would’ve thought the career trajectories of Smart and fellow wunderkind coach Brad Stevens would go in such different directions. Stevens has led the Boston Celtics to the brink of the NBA Finals, while Smart has endured three-and-a-half middling seasons at Texas, never even getting past the first round of the NCAA Tournament. At 10-6 this year and losers of four out of five games, Texas is firmly on the bubble with one of the most complex résumés in college basketball at the moment. The Longhorns have some good wins (UNC), some close defeats where they were very competitive (Kansas), and some unflattering losses (VCU, Radford). Given former Texas coach Rick Barnes has Tennessee of all programs at #1 in the country, Smart’s seat is getting hotter and hotter. If Texas misses the tournament this year, it could bring his tenure in Austin to a premature end. For much of the season, the Pac-12 was threatening to only be a one-bid league. Thankfully for the conference, it appears as though they will be saved that dubious distinction as Washington, Arizona, and Arizona State have separated themselves from the rest of the pack. However, the margin of error is quite small for all of these teams. On the court, Arizona has benefited from the weakness of the Pac 12, but that’s about all that’s gone well for them. The Wildcats are 1-3 against RPI Top 50 schools, a November win against Iowa State. Their second best victory is… Georgia Southern. Yikes. What goes for Arizona goes for the rest of the entire conference- they won’t feel truly safe unless they win the Pac-12 tournament.